Duncan Hall, the home of Computational Engineering at Rice University, generates enough interest and enough questions that I put together this collection of information about it. 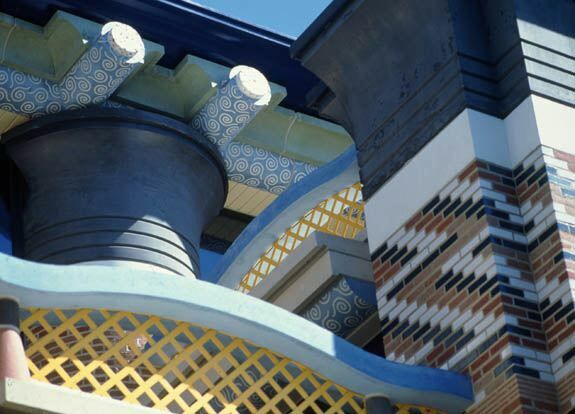 This site tries to give you a feeling for the building, for its architect, John Outram and for how he approached the task of designing it. I hope that it dispells some of the rumors surrounding Duncan Hall and conveys some facts about it that are, so often, misquoted. Outram has written a series of essays about Duncan Hall and the philosophy that guides his practice. 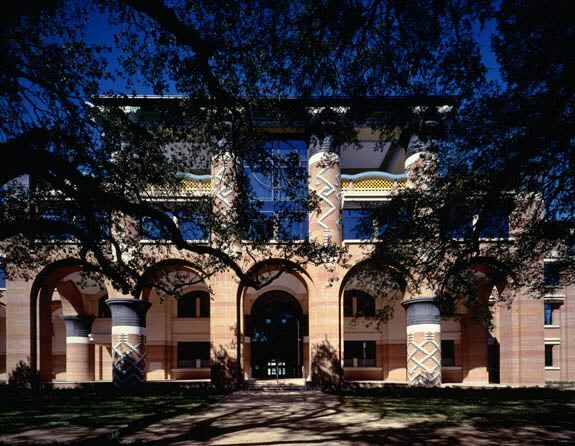 The building occupies a prime spot on the Rice University campus. It is situated north of Lovett Hall, off the University's main entrance. To visit, enter Rice via entrance one. When you reach Founder's Court (the lawn in front of Lovett Hall that terminates the main drive), Duncan Hall is visible to the right. You will recognize it from the gray column capitals, the blue rails and logs, and those amazing yellow balustrades. Visitor parking is available in the lots on either side of Founder's Court. Duncan Hall is one of the flagship buildings of the George R. Brown School of Engineering at Rice University. Duncan Hall houses the departments of Computational and Applied Mathematics (CAAM), Computer Science (COMP), Statistics (STAT), as well as a large portion of the Department of Electrical and Computer Engineering (ECE), and the Ken Kennedy Institute for Information Technology Institute It also houses the offices of the Dean of Engineering. With roughly fifty faculty and one-hundred fifty graduate students, Duncan Hall houses a significant fraction of the faculty and graduate students of the University When the building opened, it held ten percent of the faculty and almost ten percent of the graduate sudents. Duncan Hall houses five classrooms, all clustered around Martel Hall. At the north end of the hall are a pair of seventy-three seat lecture halls. Two forty-five seat classrooms and a thirty seat classroom open into the hall. The Symonds Digital Teaching Center provides space for multimedia instruction and interaction in classes of up to forty students. McMurtry Auditorium, a two-hundred twenty seat room, opens into Martel Hall. The combination of the auditorium and hall has allowed Rice to host numerous professional meetings that would otherwise have been difficult or impossible to hold. Many, if not most, tours of Rice include a stop at Duncan Hall. Something about the building must inspire a creative urge in the tour guides, because they tell some amazing stories. We collect these stories, in part for amusement, and in part to track how far afield they become. We have posted some of our favorites. Any visitor to Duncan Hall notices that it is an unusual building, in several notable ways. Among Rice buildings, it stands out for its size, its use of color, and its cavernous interior. These documents try to provide you with a feeling for the building. Of course, they are no substitute for walking around the space. Issues related to function, rather than form. These pages, derived from the booklet that I wrote for the opening of Duncan Hall, serve as an introduction to Outram's ideas. His own writings delve into these ideas in much greater detail that you will find on this site. This site is maintained by Keith D. Cooper. He was the faculty representative on the design team of Duncan Hall. He is a terrible e-mail correspondent. Serious queries about Duncan Hall should be addressed to the office of the Dean of Engineering, Rice University.